Idle Hands: In Pac-Man 256, The Glitch Bites Back! 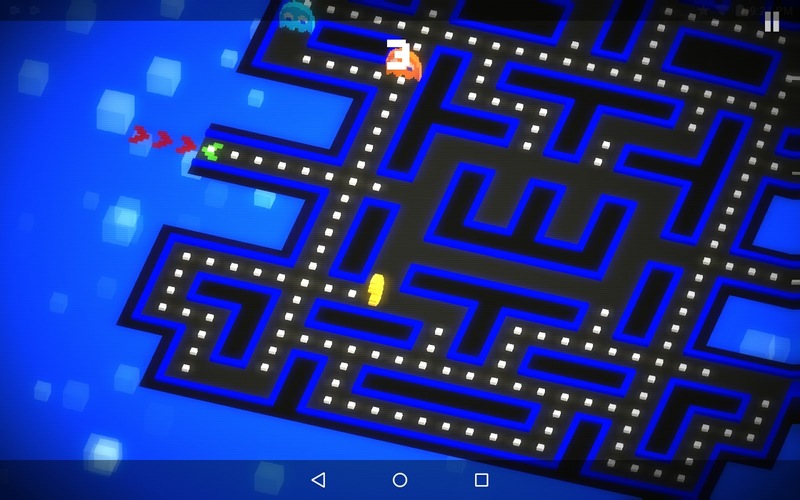 It’s a new twist on Pac-Man on your iOS or android device. Eat the dots, avoid the ghosts unless you have a power pellet, you know the drill. However, this time the glitch from the 256th board of the Pac-Man arcade game (that made beating level 256 impossible) is back, slowly eating away the maze as you head up and up. How far can you go? How long can you last? How much can you score? How relevant can Pac-Man be in 2015? Mobile phone games are all the rage these days, and many claim to offer all kinds of fun for the low low price of free, but very few games actually deliver on that promise. One game that delivered very nicely was last year’s Crossy Road. A fun take on Frogger, turning it into an endless scroller in an isometric, pixels turned into boxes kind of thing. It certainly wasn’t an obvious move to hire Hipster Whale (who made Crossy Road), but in doing so, Namco have struck gold. For anyone who hasn’t played much Pac-Man recently, it may seem unlikely for a new high score based Pac-Man game to be anything special as the fundamentals were laid down a long time ago. Hell, Pac-Man is only two months younger than I am and I’m 35. Navigate a maze of small dots while avoiding the ghosts. Eat all the dots to progress to the next level. Use the larger dots (the power pellets) to turn the tables on the ghosts for a short while. If a fruit item appears, eat that for a point bonus. Wakka wakka wakka wakka wakka. You know the game. I have no nostalgia for Pac-Man, but the fundamentals are excellent and still work 35 years later. 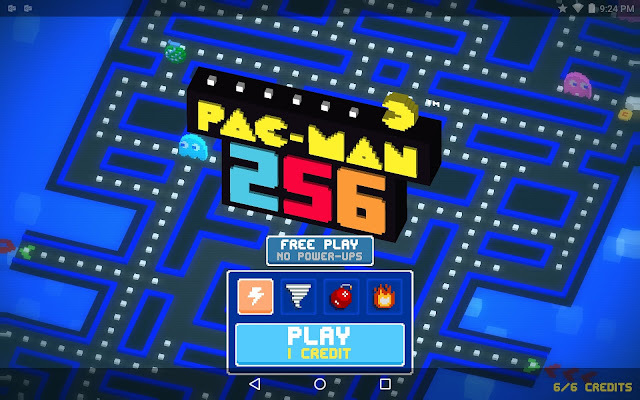 I’m more than happy to say that Pac-Man 256 hasn’t broken what works. Hipster Whale haven't made one of those free to play games that are only fun if you buy all the doodads with real money. 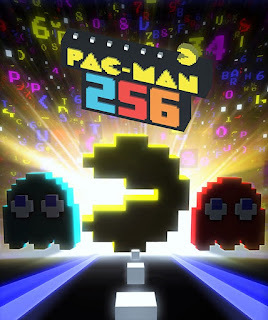 256 is as fresh as the brilliant Pac-Man Championship Edition DX was five years ago. Taking some leads from Crossy Road, Pac-Man 256 is also an endless scroller realized in an isometric, pixels turned into boxes kind of look. 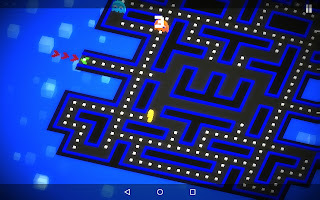 Unlike Crossy Road, which was throwing a new visual style onto Frogger’s template, since 256 comes from Pac-Man owners Namco, it remains absolutely faithful to those original Pac-Man sprites. Dots being turned straight into boxes. The game has two modes. The first has absolutely zero free to play nonsense added to it. You can play it for free as much as you like. You start near the bottom of what turns out to be a Pac-Man maze that sprawls out endlessly upwards. 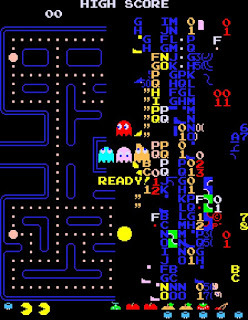 Numerous kinds of ghosts, some that move exactly as they used to, but many that don’t, patrol the area, and slowly, but surely the glitch from Pac-Man’s level 256 eats away the board from the bottom up. As expected, you want to eat dots, fruits, and power pellets to get as high a score as you can, and stay alive, but no longer are you thinking about clearing all the dots on the board. 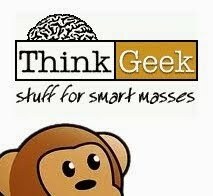 Instead you are thinking about your dot chain. When you look at the dots in 256 you’ll notice that there are regularly gaps in the dots when you go certain ways. As you eat unbroken lines of dots, the game counts them and your score goes up. When you hit 256 it sets off a huge shock wave wiping out any nearby ghosts. It’s hugely satisfying. Trying to spot these ‘paths’ of dots as you eat your way upwards, identifying the areas where the ghosts may trap you or cause you trouble, is the fresh part of 256. It’s a wonderful mechanic. When a ghost forces you into an area where your chain has to break, you’ll be cursing them, and when you are racing a ghost to a junction to keep on the chain, and you make it, and then hit 256 dots and blast the little devil off the board, you’ll feel like the biggest badass around. to continue. These tokens are how they monetize the game and the game dolls them out pretty generously. While you max out at six tokens, you earn one every ten minutes. If you choose not to continue, the game will give you the chance to watch an advert to earn some coins (which you use in the other mode in the game) and also it gives you a specific target like ‘Eat 4 strawberries’ or ‘Eat 8 ghosts’ that you can work on to also earn more. You don’t have to do them in one game. The freeplay basic mode is a blast and the boards and patterns change every time to keep it fresh. Pac-Man having just his traditional abilities of power pellets ensures that comparing high scores here keeps it a level playing field. The other mode will cost you one of those tokens to play, offering a bunch of different power ups. You can pick three power ups to use at a time, and these will replace some of the power pills. As you play the game, you will unlock more and more of these power ups, and you can use the coins you earn playing the game to upgrade them. Upgrading a power up makes it unavailable for a while (and that time gets longer as you level up powers more and more) but it increases how long it lasts, or how many points you score for killing a ghost with it. I haven’t unlocked them all yet, but I’ve unlocked about half of them, and they remain pretty fun to use. They include a laser that shoots out from Pac-Man’s mouth in the direction he is heading, killing any ghosts in its line of fire, a stealth power up that lets you sneak past ghosts, a fire power up that leaves a burning trail behind you that kills any ghosts that come into contact with it, and a tornado power up that hunts down the nearest ghosts. 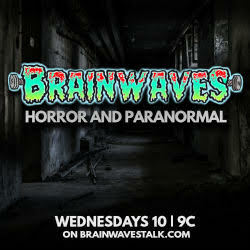 There’s more than a dozen to discover, and part of the fun is unlocking these and seeing what each one does. You can buy a few dozen credits, should the one every ten minutes or so not be enough, and if you really love the game, you can spend $8 dollars to remove the credit limitation on playing this mode. I haven’t made my mind up yet on whether or not I want to do this, but as I’ve been perfectly happy playing the free mode while waiting for my credits to fill back up, I don’t think I will. Pac-Man 256 has a great look, is really easy to play from the second you begin, and a total blast overall. The endless randomly generated level and single life (unless you want to use a credit) keeps me coming back again and again to see if I can beat my previous score. You only need a spare few minutes to have a few goes which makes it perfect as a free phone game. The only criticism I have is that the game could have done with some music (one area that CE DX has the game beaten, hands down). If you ever had fun chasing blue ghosts around a maze and have an iOS or android device, this generous free to play offering is something I feel safe giving Namco and Hipster Whale’s latest take on the formula my strongest recommendations. Download it right now.